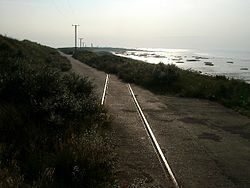 The railway on Spurn Point was constructed in 1915 when a means was required to easily transport material around the area. This was particularly important with the construction of the defences around Spurn and the Sea Forts at Haile and Bull Sands. The roads around Spurn and Kilnsea were very poor, often narrow and winding and between the end of the point and Kilnsea there was no road at all. The railway was designed to connect Kilnsea with Spurn allowing supplies and materials to be brought by boat from Hull to Spurn, and by rail to Kilnsea. The railway was entirely separate from the rest of the rail network; which brought problems with bringing rolling stock to Spurn. The first section to be built was a pier at Spurn on which the line terminated; this allowed building materials to be carried from Hull straight onto the line by boat. Soon afterwards the railway was constructed, stretching from the battery at Kilnsea to Spurn, where it terminated on the jetty. The Railway was constructed by C.J. Wills and Son, a major contractor of the period who was responsible for the construction of many of the 1st World War defences in the area. It was a single track line of standard gauge, which had four passing places along its length. The rails used in the construction were generally second hand, and were often marked M.S.& L.R. (Manchester, Sheffield & Lincolnshire Railway) or G.C.R. (Great Central Railway). The railway provided benefits beyond its initial usage, providing Spurn with a much needed link to the outside world. This applied not just to the battery on the spit, but also to the small community of full time lifeboat men who lived and worked there. The railway ran official hourly services down the spit to Kilnsea and was used for the transport of personnel not only to Spurn fort, but also for shipment to Bull Sand and Haile Sand forts out in the estuary. The railway had many logistical problems, not least those of blown sand, and flooding in bad weather, a common cause of engine failure. A number of different forms of transport used the railway, some quite bizarre. Initially, during the construction of the defences three identical Hudswell Clarke 040 locomotives were used by Wills, the `Lord Mayor', `Frances', and `Somerton'; `Lord Mayor' still survives on the Keighley and Worth Valley Railway. A fourth locomotive was used in the construction of the site, the 060 Class L engine `Bombay'. The locomotive which was permanently stationed at Spurn was the 060 `Kenyon', purchased by the War Department from C.J. Wills in 1916. `Kenyon' remained in service for some 13 years, but was allowed to deteriorate in condition over the final years of its life, with the removal of side rods, the locomotive turning from a 060 to a 240 and finally a 222. Besides the `Kenyon' conventional locomotives were restricted to a brief appearance by a LNER (London and North Eastern Railway) Y8 Locomotive in 1940. The railway was characterised by the use of rather unusual forms of transport, the most bizarre being the converted `Ital' racing car, which was cobbled together and kept working by a number of strange amateur repairs for some 25 years. 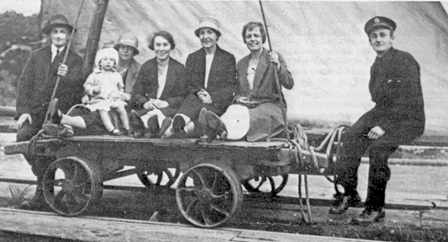 In addition transport was provided by petrol driven railcars, such as the unpopular and unreliable Hardy railcar, which often derailed at chalk bank, and the better Hudswell-Clarke railcar. 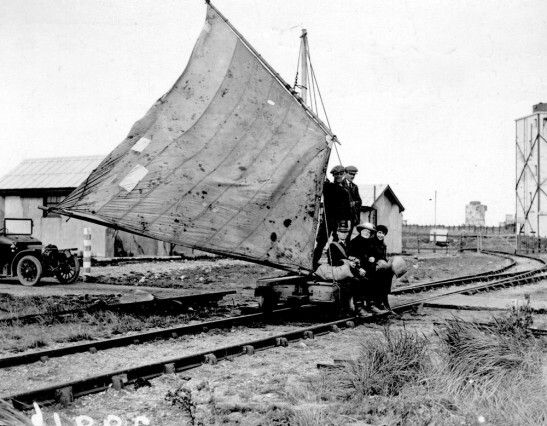 The longest lived transport was the simple sail cart used by the lifeboat men on the spit, this was a simple cart with a traditional sail rigging, unfortunately it had no brakes! Housing for the locomotives was provided by an engine shed within the Spurn fort, and the rails finished on the jetty to allow supplies to be transferred straight from the boats to the railway or vice-versa. The railway became of less importance during the 2nd World War, when a road was built down to the spit. The rails were finally removed in 1952, and the rolling stock was scrapped. The site was visited by the Fortress Studies Group in 1992. They found the rails to mostly have been removed, apart from some set in concrete. The only surviving evidence for the railway beside this is the bank on which the track ran, now a public footpath. The FSG considered the site to be at risk from coastal erosion.